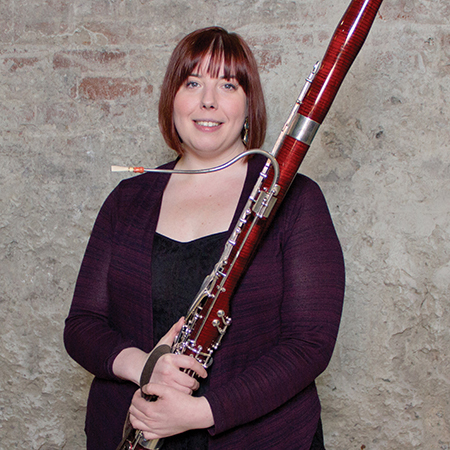 Born in the Lower Mainland, Gwen Seaton* is currently Second Bassoon with the Vancouver Symphony Orchestra, a position she has held since 2009. She received her MMus earlier that year from the Shepherd School of Music at Rice University, studying with Ben Kamins. Selections from her final grad recital were aired on NPR’s “Performance Today”. Gwen also holds a BMus from the University of British Columbia where she studied with Jesse Read and Chris Millard. Prior to joining the VSO, Gwen played Second Bassoon with the Louisiana Philharmonic Orchestra for the 2007/2008 season and has also served as Acting Principal for the Vancouver Opera. She has participated in the National Youth Orchestra of Canada and more recently the Music Academy of the West. As a soloist, she has performed with the Shepherd School Chamber Orchestra and the Music Academy of the West Festival Orchestra.